Sorrel has a tangy and acidic flavour that is similar to lemon. Learn more about this unique ingredient, including where to buy it and how to cook with it! 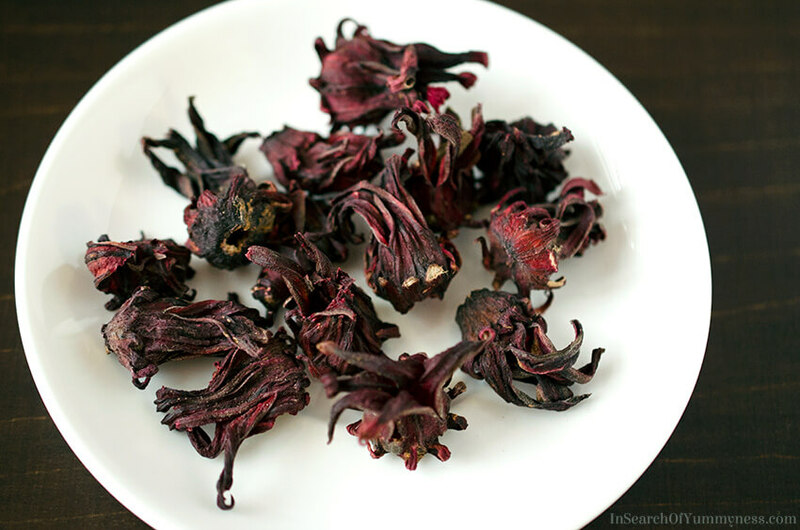 Sometimes referred to as Jamaican sorrel, or Caribbean sorrel, sorrel is the common name given to the sepals of a hibiscus plant called Roselle, (or Hibiscus sabdariffa if you want to get technical). It’s important to note that there is a leafy green herb that is also called sorrel, but it is unrelated to this plant. These bright red buds are often steeped to make drinks or flavour other recipes. The sepals may actually be edible, but I haven’t heard of anyone ever eating them. All of my experience with this ingredient has been through preperations where you boil/simmer the sepals in water and then use the resulting “tea” in whatever you’re making. I’m Trinidadian, and we make something called Sorrel Drink. This tangy, spice-infused beverage is popular throughout the Caribbean, and is often served during the winter holidays. 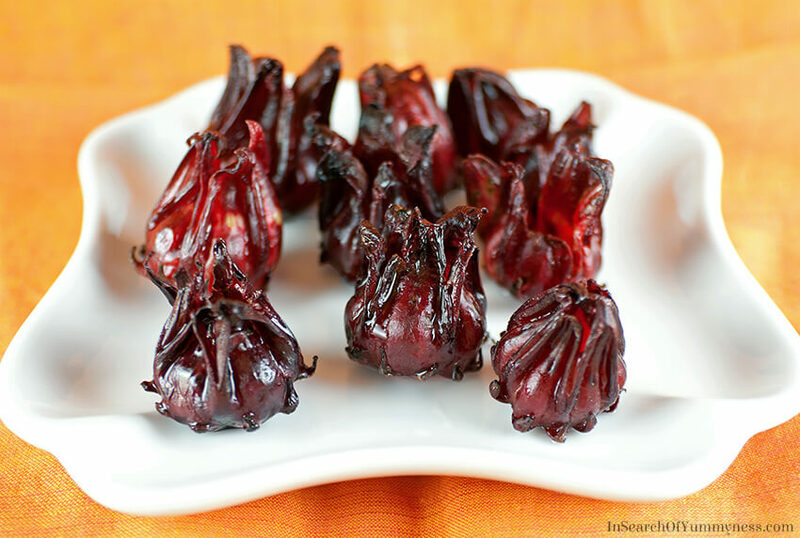 In Mexico they have something called Flor de Jamaica, which I think is also Roselle. I found some conflicting information when I was doing my research today, but most of the sources I looked at showed the same kind of sepals that I have in this blog post. I had hibiscus agua fresca when I visited Mexico, and it had the same red colour and tangy flavour as what I’m used to making at home, so I’m assuming the Mexican kind is the same as the Caribbean kind. 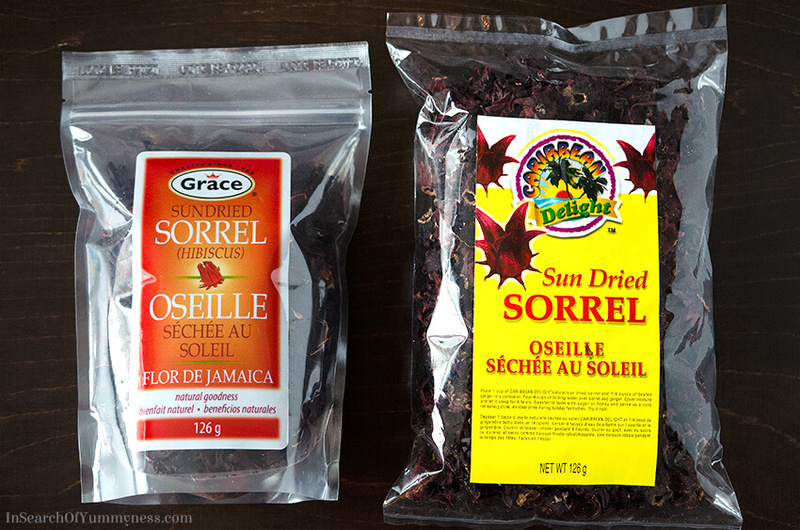 Sorrel can be found is Caribbean speciality stores, and some major grocery stores, in both fresh and dried forms. The dried ones are generally easier to find all year long, and are easier to store since they last for a very long time. You can also buy them online from Amazon. One thing to keep in mind is that sometimes the dried buds are not whole. The Grace brand in the photo below has broken pieces, while the Caribbean Delight brand has whole buds. I haven’t found that one is better than the other – especially since you’re probably going to soak and then discard the actual buds anyway. The fresh buds are not usually available until Christmastime, at least here in Ontario, Canada. While they are really nice to use, they can go mouldy quite quickly. It’s best to keep them in the fridge until you are ready to use them. What to Cook with Sorrel? As I mentioned above, Caribbean people make something called Sorrel Drink. The exact recipe varies from country to country, and family to family, but it’s basically sorrel steeped in water with spices and sweetened with sugar. Sorrel can also be used to make Agua de Jamaica, (which tastes like a fruity lemonade), or one of those fancy coffeeshop summer beverages. Elme from Freak In the Kithen TO told me that she uses sorrel to flavour and colour marshmallows, and Swiss meringue buttercream too! I haven’t tried that myself, but I bet they would take on a pretty pinkish/red colour, and have a pleasantly tangy flavour. Try simmering about 2 cups of dried sorrel in 10 cups of water for about 10 minutes, then allow to cool. You can use the liquid to make fruit punch, add to cocktails or even make popsicles! The fruit, lemon-like flavour is very refreshing – perfect for summertime treats. Just be sure to balance out the acidity with something sweet, like sugar, honey or agave.